The localization support for RadListBox lets you completely translate the user interface, or simply adapt a few strings. This technique is useful when customizing some of the messages of a particular instance . The messages are not shared between RadListBox instances. A complete translation using this approach is not appropriate. Delete Delete Sets the text of the Delete button. The button appears when AllowDelete="True"
MoveDown Move Down Sets the text of the Move Down button. The button appears when AllowReorder="True"
MoveUp Move Up Sets the text of the Move Up button. 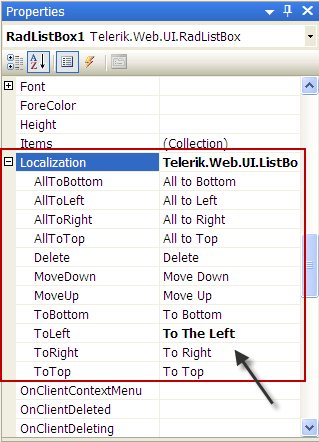 The button appears when AllowReorder="True"
The primary means for localization in ASP.NET is to use resource files. Resource files are simple XML files that can be easily edited and transferred to other applications. You can use resource files to change the default (English) localization for RadListBox that is stored in the Telerik.Web.UI assembly. 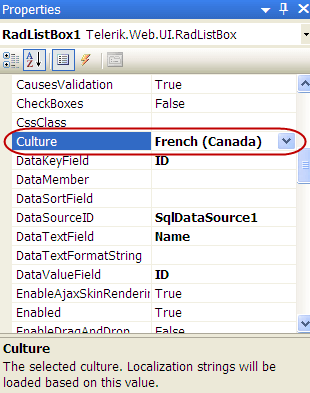 The Culture Identifier consists of a language code followed by a dash and the country code.Example: “en-US”, “fr-CA” and so on. Edit the strings using the Visual Studio editor or your favorite text editor. Customize strings just as you would set the Localization property.